Aristophanes (arr-iss-TA-fa-knees) lived in Athens, in ancient Greece. He lived about the same time as another playwright, Euripides. That was about 450-388 BC. But Euripides wrote tragedies – sad plays. Aristophanes wrote comedies – funny plays. Most of Aristophanes’ plays are political satire. They make fun of the politicians of Athens. Or they make fun of philosophers. Sometimes Aristophanes’ plays make fun of politics in general. Other times he makes fun of specific politicians for saying something dumb. Or maybe they said something Aristophanes disagreed with. You might say Aristophanes was the Daily Show or Colbert or SNL of his time. But he only produced plays a few times a year, not every day. For example, one of Aristophanes’ plays, Lysistrata, poked fun at the generals who would not end the Peloponnesian War. The play joked that women could do a better job of making peace. Another play, the Frogs, was a sad commentary on the deaths of Sophocles and Euripides, and on how hard it was to use art to make peace. Aristophanes’ play Wasps makes fun of the Athenian jury system. Like the tragedies, Greek comedies were performed in a competition. This contest was itself part of a religious festival. Aristophanes often won these competitions, so the judges must have thought his plays were good. Aristophanes I: Clouds, Wasps, Birds, translated by Peter Meineck (1998). All Aristophanes plays have a lot of dirty jokes in them, and these are no exception. Be warned. Lively, and suitable for play production. Aristophanes and Athens: An Introduction to the Plays, by Douglas M. MacDowell (1995). Explains the meaning of the jokes and political commentary in the plays. For adults. Cite this page: Carr, K.E. 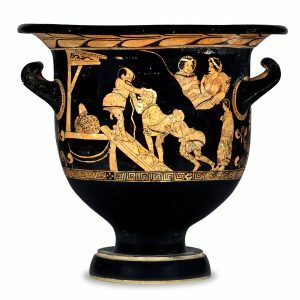 Who was Aristophanes? Greek playwright. Quatr.us Study Guides, July 9, 2017. Web. April 26, 2019.